Graves Light was declared surplus property by the U.S. Coast Guard and auctioned to the public by the federal General Services Administration. 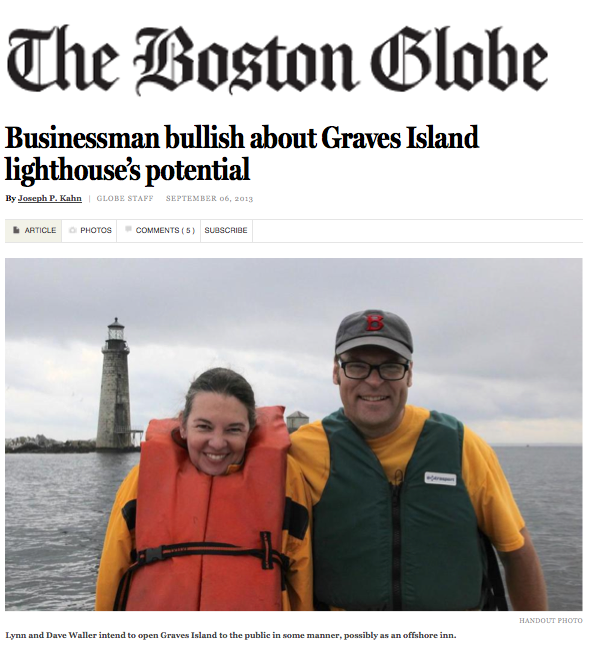 A Boston-area family bought Graves Light in the late summer of 2013. For our own updates of Graves Light’s progress, see The Keeper’s Blog. For the wicked big news, see this page below. Joseph P. Kahn, “Renovation of Graves Island lighthouse inches forward: A long to-do list for feeling at home on island,” Boston Globe, September 16, 2014. Boston Globe, “You spent $1m on a lighthouse. Now what?” Otherwise titled “Light Housekeeping,” December 29, 2016 (by Emily Sweeney). 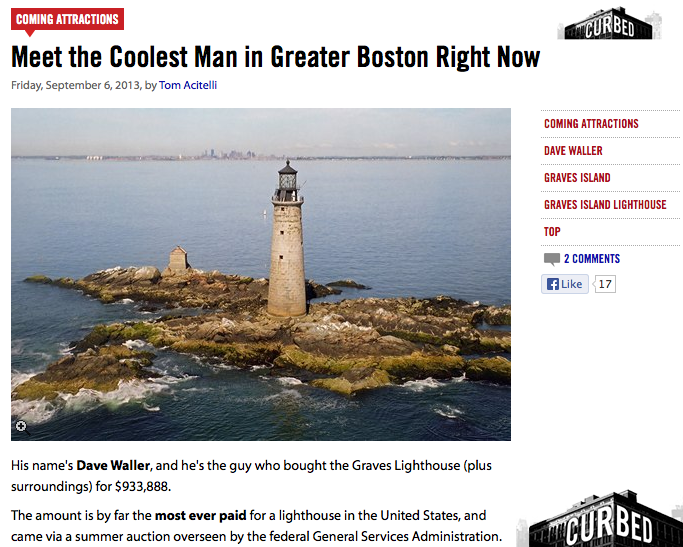 BostonCurbed.com, “Coolest man in greater Boston builds out his lighthouse,” September 16, 2014 (by Tom Acitelli). Associated Press/Boston Globe, “Plenty of light! Feds are selling off lighthouses,” September 4, 2014. 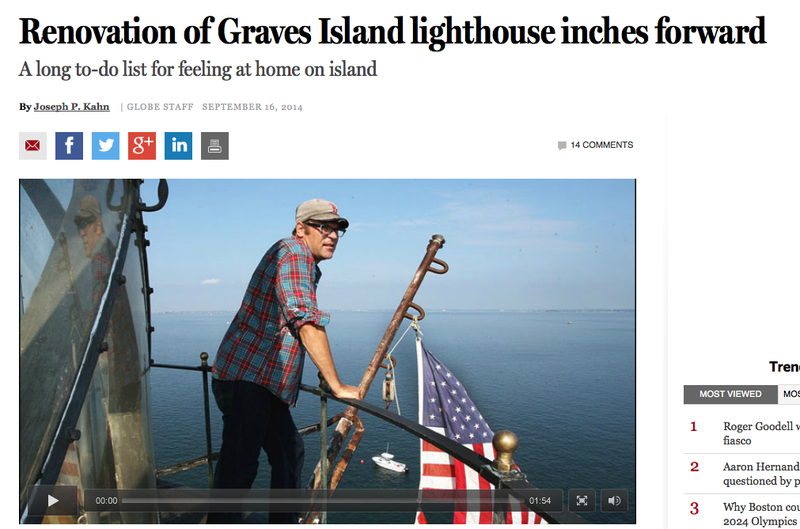 Boston Globe, editorial, “Lighthouse auction: Still a beacon on Graves Island,” September 16, 2013. For older articles about Graves Light, see Jeremy D’Entremont’s wonderful website, NewEnglandLighthouses.net. The Graves Light bibliography page contains listings of articles going back to 1904.
congrats to this wonder of a purchase. I have but a small question…..who was he guy who bid $933.887 and then quit…what if he went, 933.889….what was the tipping dollar…..imagine losing out on such an amazing purchase for a buck.